Christmas in Colombia is a religious event also mixed with lots of “parranda” or fiesta, like it is common in Hispanic culture. As soon as December starts we take out our decorations which must include “el pesebre” or nativity, the Christmas tree, red and white candles, angels, and lights that we display on the windows or balconies of our home. In Colombia Christmas or “Navidad” starts on December 7th by celebrating the day of “La Virgen de la Inmaculada Concepción” or The Virgin of the Immaculate Conception. This day is widely known as “El Día de las Velitas” or the day of the candles. How do we celebrate “El Día de las Velitas”? Simple, we start at dusk by lighting candles (skinny ones) on long pieces of wood board to make infinite lines that illuminate the front of homes, house complexes, churches, etc. “El Día de las Velitas” is not complete until we mix in dancing music, foods like “buñuelos” or fritters, “empanadas” which are fried dough stuffed with potatoes and meat or grilled meats. We drink rum and the famous “Aguardiente,” an anise drink that is pretty powerful. Christmas in Colombia is deeply rooted in Catholic tradition like most of the Hispanic culture countries, therefore the novena is a must. On the 16th of December we reunite with family members, and I mean everybody, each night until the 24th to pray the novena. “La Novena de Aguinaldos” is a special occasion to get closer to our faith byremembering the birth of Jesus. 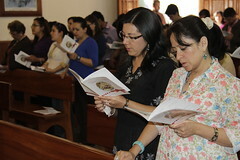 Each night of the novena we sing “villancicos” or Spanish Christmas carols and enjoy typical Hispanic Christmas foods. The novena can rotate from one home to another or in many cases, the grand parents host it and everybody brings a dish. There is no doubt, celebrating Christmas in Colombia is a major event for our children. The first thing they do is to write a Carta al Niño Dios or baby Jesus. The letter goes in the nativity from where it mysteriously disappears, meaning baby Jesus took it so he can know what presents to place on or near your bed on the 24th of December. It can also remain on display for baby Jesus to read. Nativity Underneath the Christmas Tree. Christmas traditions in Colombia also have a lot to do with giving during this time of the year. We buy gifts and ask the children to help us wrap them to deliver them at corner streets where less fortunate children may be begging. We let our children stay up late expecting to see baby Jesus delivering presents. The youngest ones fall asleep before midnight. The older ones stay up late and participate in games like finding the baby Jesus with money that one of the adults previously hid. In Colombia Christmas gives an opportunity to indulge in typical foods by enjoying a special “Cena de Navidad” or Christmas Eve dinner. 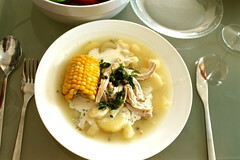 The main dish can be pork, ham or even Ajiaco Bogotano, a hearty chicken soup people from the capital cook. If you are celebrating Christmas in Colombia on a farm, which is what we call our second homes, the main dish is a roasted pig or an “asado” which includes a variety of grilled meats. We do the “asado” with coal not gas, and it is outdoors while we enjoy the wonderful weather. 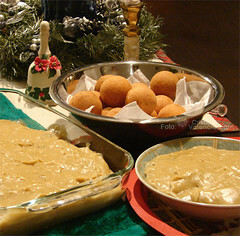 During Christmas in Colombia the entire country enjoys a dessert called “Natilla.” We make it with cinnamon, corn starch, milk, “panela” a hard sweetener from sugar cane, and cloves. “Buñuelos” or cheesy fritters, “arepas” a thick corn mass, “empanadas,” “hojuelas” a fried dough pastry with sugar and jam are amongst the favorite munchies. My mom used to make a multicolored gelatin dessert with “leche consensada” or condensed milk that always turned out to be delicious. For dessert, people who live on the Atlantic coast prefer “arroz con coco” or coconut rice pudding, and people who live in the colder states close to the capital prefer “postre de natas,” which is made with milk and condensed milk cooked with sugar, cinnamon and raisins. At midnight we toast with “aguardiente,” rum or champagne. We also have “ponche de frutas” or fruit punch, and “Micheladas” which are beers with salt and lemon. Many people “quema pólvora” or light fireworks during the month of December even though they are prohibited. Children always get sparklers. We also love to “elevar globos” which are paper globes that we light inside to let them fly freely in the sky. It is a nice tradition because requires many people to hold many corners of the “globo” while one person lights it. Many families after going to mass on the 24th and celebrating “La Nochebuena” continue partying the next day on the 25th. We typically wake up very late, eat leftovers, play more music, and have more fun. On the 31st of December we say good bye to the old year and prepare ourselves to receive the New Year. In many areas of the country, people reunite on their “fincas” to make a human size rag doll stuffed with fireworks. Christmas in Colombia follows many traditions or “agueros” to bring on good fortune in the new year, for example, we wear new clothes, we eat 12 grapes during the final 12 seconds of the old year, we wear something yellow, we broom our homes and clean them very well to take out all the bad energies, we do “saumerios” or cleansings of the homes with eucalyptus leaves, etc. Last but not least we continue feasting with typical foods and partying with excellent dance music. Three Kings Day is not such a special event in Colombian Christmas like it is in Central America, even though we celebrate it. Hispanic Christmas decorations are very important during the festivities. Many families take pride in adorning their homes for these special days. The Christmas tree or el arbolito de navidad is a most as well as the nativity or pesebre. Lots or Christmas ornaments hand in beautiful decorated trees, and we specially value ornaments that reflect our artisans traditions and materials. My parents loved ornaments that Andean artisans made using fibers, woods and materials that came from South America and that depicted typical nativity scenes from catholic traditions. Gourd, cloth and ceramic ornaments have a special place in our hearts. I confess I have cloth and straw ornaments that are handmade that we hang in our tree every year.